"This is the best book on patterns since the Gang of Four's Design Patterns. The book manages to be a resource for three of the most important trends in professional programming: Patterns, Java, and UML." Since the release of Design Patterns in 1994, patterns have become one of the most important new technologies contributing to software design and development. In this volume Mark Grand presents 41 design patterns that help you create more elegant and reusable designs. He revisits the 23 "Gang of Four" design patterns from the perspective of a Java programmer and introduces many new patterns specifically for Java. Each pattern comes with the complete Java source code and is diagrammed using UML. Trial versions of Together/J Whiteboard Edition from Object International (www.togetherj.com); Rational Rose 98 from Rational Software (www.rational.com); System Architect from Popkin Software (www.popkin.com); and OptimizeIt from Intuitive Systems, Inc.
MARK GRAND is an Atlanta-based consultant with over twenty-three years of experience in distributed systems, object-oriented design, and Java. He is currently working on an open source framework for gluing components and programs into an application. He is also the author of Patterns in Java, Volume 2 and Java Enterprise Design Patterns (both from Wiley). 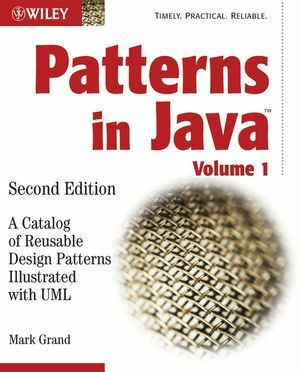 Appendix: Overview of Patterns in Java, Volumes 1 through 3. Visit the book's web site here http://mgrand.home.mindspring.com. This site includes the code for the book.